A consulate was opened in 1946, when France recognised the independence of Vietnam, and was upgraded to a consulate-general in 1954. It remained open throughout the Vietnam War 1964-73. Full diplomatic relations were established in 1975, when the mission was upgraded to an embassy. From the early [?] 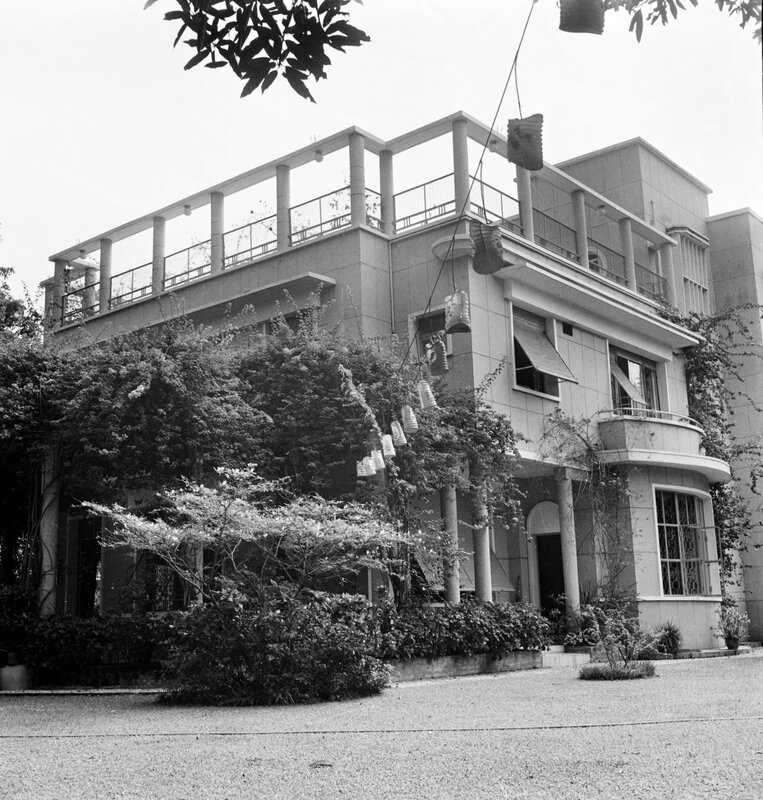 1960s, the residence was leased at 15 Phan Chu Trinh Road on renewable short terms from the Diplomatic Service Bureau. It is a modest but comfortable two-storey villa with three bedrooms, with an attractive small cruciform plan with a double height octagonal hall in the centre [?correct]. It had a paved garden at the rear, into which a swimming pool was, just, inserted in 1985 to ameliorate living conditions in an extremely difficult Post. A six-month refurbishment contract was undertaken in 1997 by Gamvico (a subsidiary of Gammon HK). The building is now heavily overlooked by surrounding developments but retains some charm as a residence. The offices were on the ground floor, with a staff flat above, of a two-storey villa at 16 Pho Ly Thuong Kiet, leased on the same terms as the residence, and about 100 metres from it. The offices and its outbuildings were impossibly crowded and inefficient throughout the 1980s but no alternative premises were available until the first new multi-occupancy commercial blocks were completed in the mid-1990s. The embassy moved into a floor of Central Building at 31 Hai Ba Trung in 1997. There was a consulate, succeeded by a consulate-general, in Saigon from 1912 until 1950 when the Post was upgraded to a legation. It became an embassy in 1954 when South Vietnam came into existence. Saigon reverted to a consulate-general in 1975 when Hanoi became the capital of re-united Vietnam. In 1920 the consulate was occupying disreputable premises and a search for a site on which to build new ones was under way. The Spanish government was prepared to cede a suitable site, known as the ‘Garden of Spain’, in Rue McMahon but it was not until 1928 that the documentation was finally ready for signature. The Office of Works in Shanghai produced a design for a building on this site in 1925. Meanwhile, the French government of Cochinchina had decided that it would prefer the Spanish site, which was opposite Government House, to be left as open space but it was prepared instead to offer the British a good alternative site of about 0.35 hectare on Boulevard Norodom (formerly Rue Imperiale, later Dai Lo Thong Nhut, now Dai Lo Le Duan). The two transactions, of the Spanish transferring their site to the British and the British immediately exchanging it for the French site, were signed within days of each other in December 1928. The Office of Works adjusted the previous plans to suit the changed site and a consular residence was completed and occupied on this site in November 1932 at a cost of about £16,500. It was completely destroyed by an Allied bomb on 7 February 1945, and the site was cleared in 1947. The intention in the early 1950s was to build a new residence on the same site but higher priorities intervened and, at the end of 1954, the Post identified a possible house for purchase instead. It was still under construction on a ½ acre site, at 261 Phan Thanh Gian (formerly Rue Legrand de la Liraya, now Dien Bien Phu) but was a good find and was bought for about £90,000 in January 1955. The offices had long been in the Hong Kong and Shanghai bank building at 1 Rue Georges Guynemer but by the late 1950s needed a building of their own. 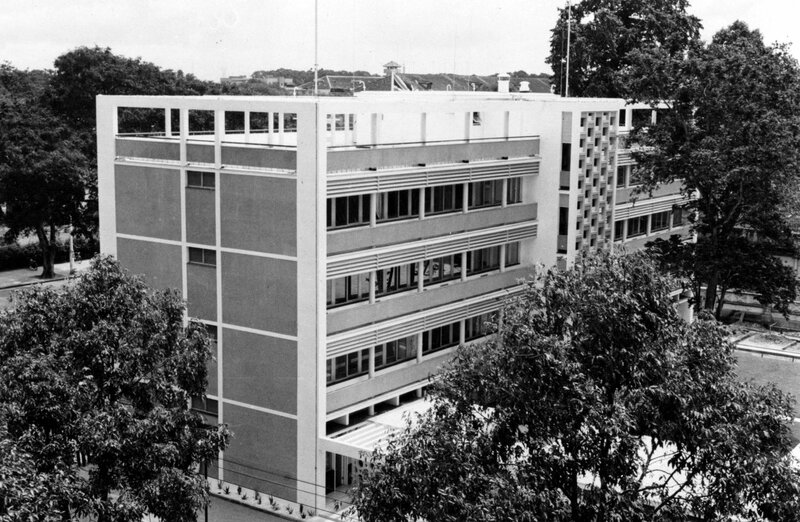 With the residence problem solved, the Boulevard Norodom site became available for new offices, which the Ministry of Public Building and Works built in 1962, including quarters for six Gurkha guards. The foundation stone was laid by the ambassador, HAF Hohler on 17 April 1961. 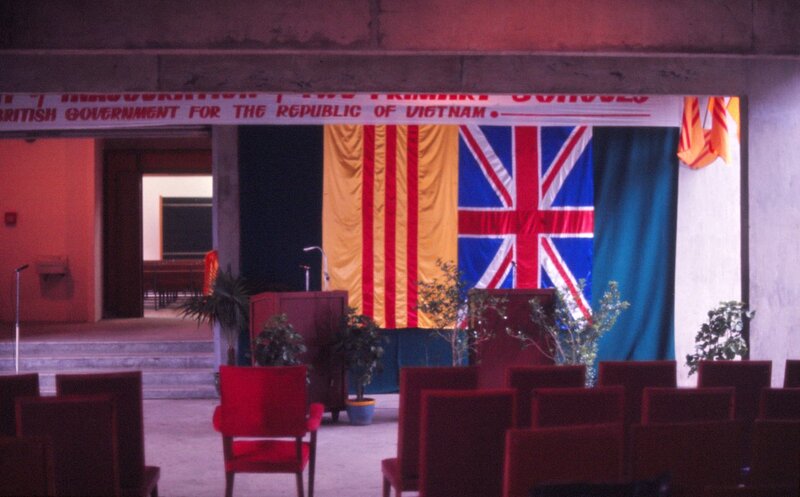 Following the end of the Vietnam War in 1975, Britain’s five properties in HCMC were expropriated by the Socialist Republic of Vietnam. 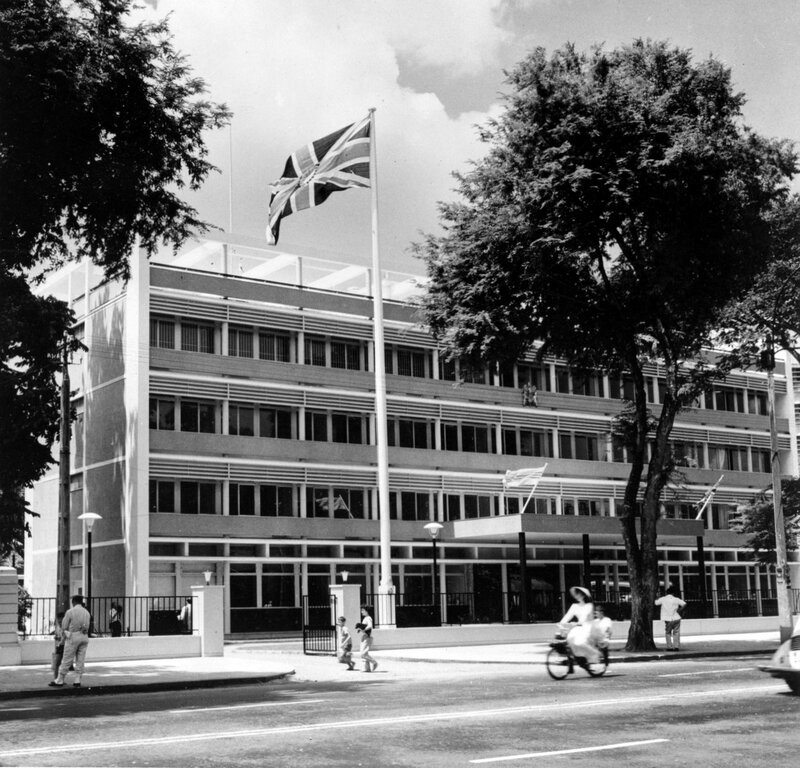 A claim was registered with the Vietnamese in the sum of £753,467, and a subsequent negotiation process eventually resulted in Enterprise Oil being permitted to lease most of the residence and John Laing International being contracted to refurbish the 1962 office building at 25 Dai Lo Le Duan in stages to enable it to be occupied partially by the consulate-general and partially by suitable tenants. Compensation for the expropriated other two houses (at 55 Rue Duy Tan and 157 Rue Yen Do) and the swimming pool site (at 109 Duong Nguyen Dinh Chieu) was settled in [?] 2005. 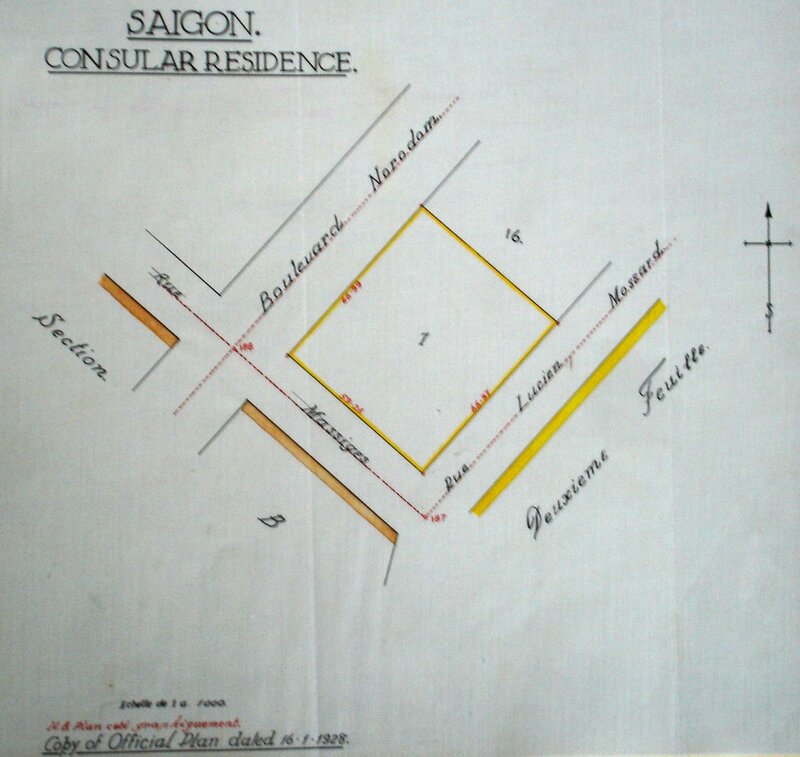 Location plan of land for consular residence, 1928. 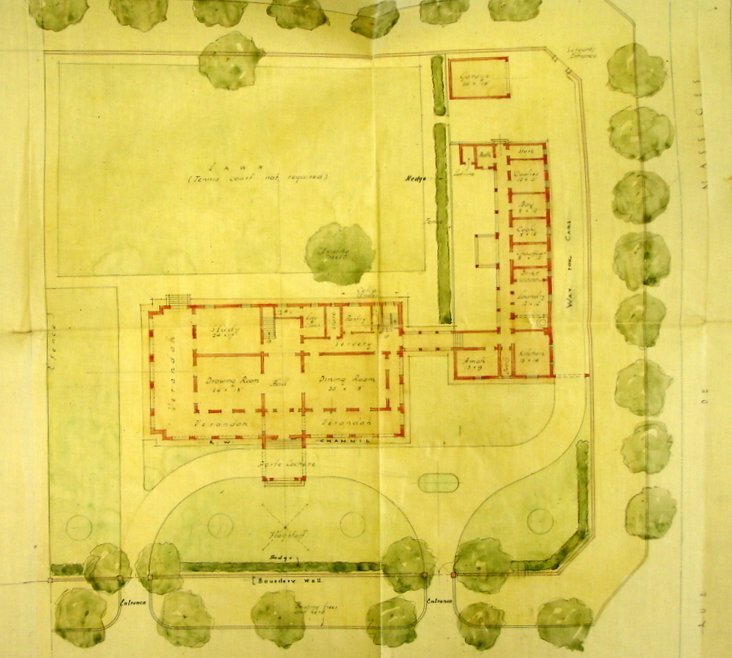 Plan for consular residence, 1929. 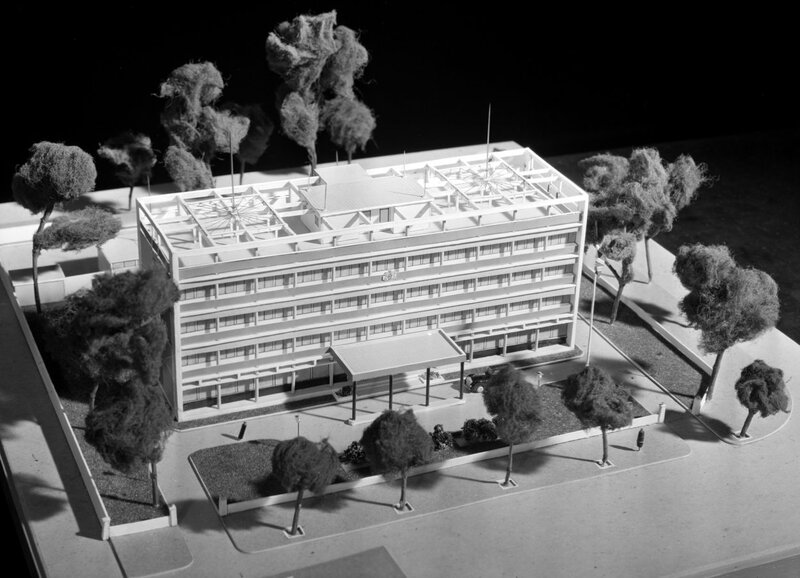 Model of the proposed Saigon offices, 1960. After the Tet offensive in February 1968, a large area of Minh Mang, a densely populated area in Cholon, on the edge of Saigon, was devastated, and thousands of families left homeless. USAID organised the construction of a large apartment complex for low income families in the devastated area, and the UK’s Ministry of Overseas Development funded and the Ministry of Public Building and Works constructed, two primary schools to serve the area, one with 24 and the other with 12 classrooms, all intended to take three shifts a day. The buildings started on site in August 1969 and were completed two years later, at an outturn cost of £495,000. The project architect was Mark Bertram, of the Ministry’s Regional Office in Hong Kong. 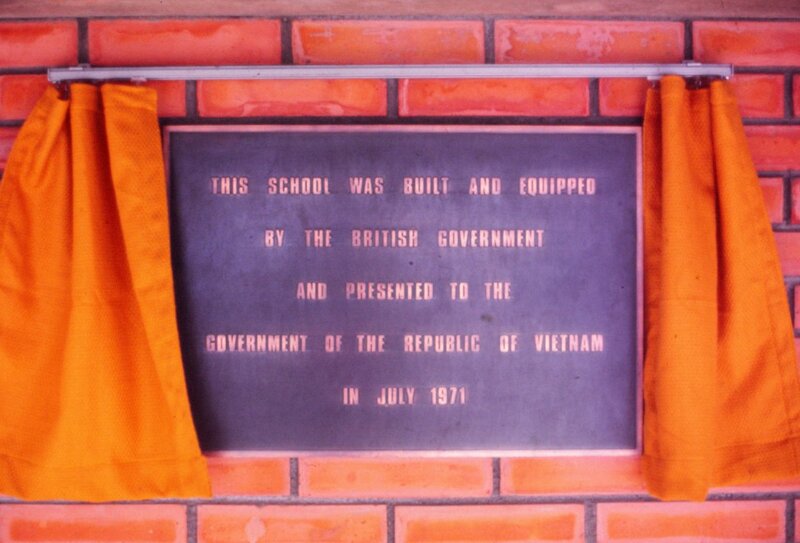 The ambassador, John Moreton, presented the schools to the acting Prime Minister on 26 August 1971. 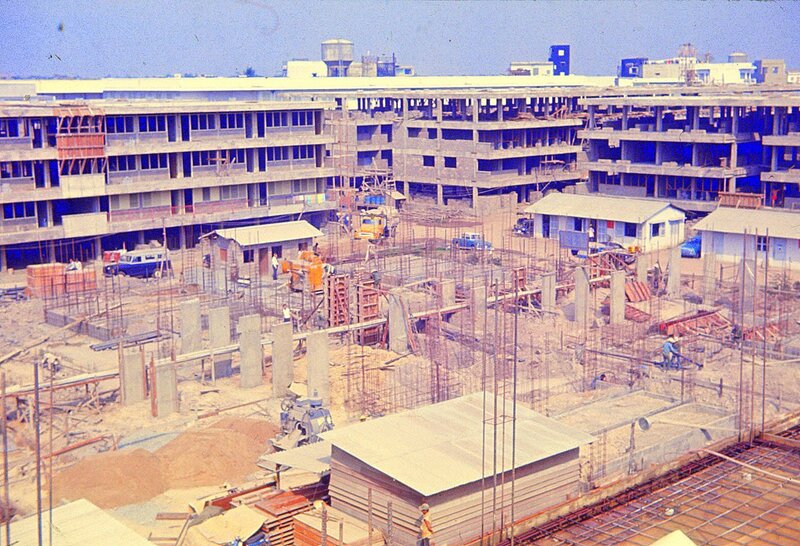 USAID construction of cheap housing in Cholon, 1971. All set for the opening of the schools, August 1971. 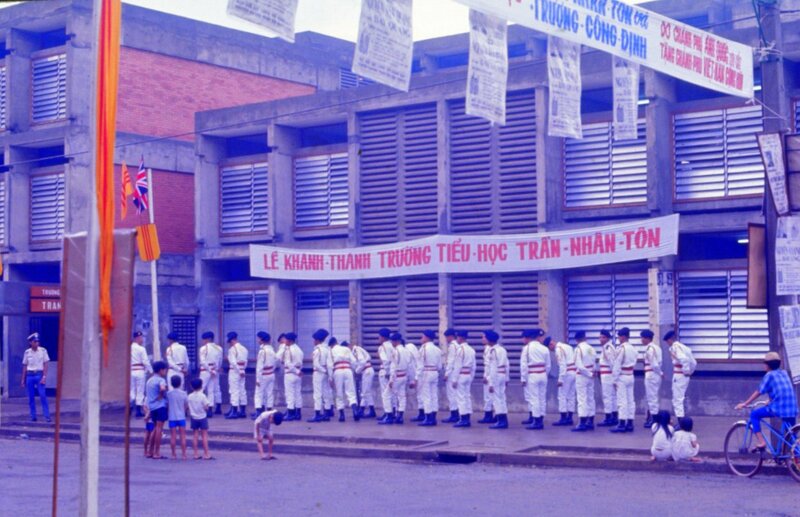 An honour guard outside one of the schools, 1971.